Are you a parent or family member of someone who identifies as LGBT+? 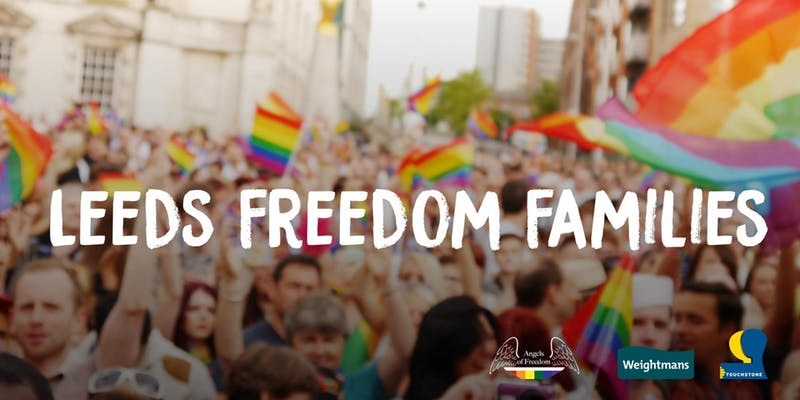 This LGBT+ History Month 2019 will see the launch of Leeds Freedom Families. Come to our celebration & engagement event bringing together supportive families of people in the LGBT+ communities of Leeds, as champions and allies to share their experiences with others. At this inaugural event we will be bringing together both parents and members of the LGBT+ community to celebrate, network and share experiences of being family members of LGBT+ communities. You will hear personal accounts from parents of LGBT+ people and information from representatives of national and local organisations who will talk about the value of peer support groups. We would also like to hear your thoughts on how we can plan our sessions going forward. During the second part of the event there will be an opportunity to meet one another and share experiences over a tea, coffee, beer or wine! Please note: This is both a celebration and information sharing event, we welcome discussion but attendees will not be expected to share their own experiences or publicly introduce themselves if they don’t want to. Leeds Freedom Families is an informal peer support group for family members (particularly parents/grandparents) of those who identify as Lesbian, Gay, Bisexual and Trans (LGBT+). Our group meets once a month to provide a safe and welcoming space for family members of LGBT+ people. In 2018 Angels of Freedom were contacted by a national organisation who support family members of LGBT+ people, they were asking for advice on where to direct people who need support in Leeds. It came to our attention that other than the great work Mermaids do for Trans & gender questioning children & families, there wasn’t another local group or place to refer people who are looking for wider support. This lead to a conversation around the challenges family members can have around understanding and accepting their LGBT+ family members and the value that can be found by the provision of peer support available through groups. It is a well-researched fact that empowered and supported young people have the opportunity to thrive in their lifetime, while those who are presented with challenge and isolation can be impacted negatively in all aspects of life. Parents and families can help to break this cycle for their own children/adult-children and family. Leeds Freedom Families came together to provide a space to do just this – to learn from one another, to support one another so that we can understand, accept and celebrate our LGBT+ family members. We're very appreciative of Touchstone Support & Weightmans law firm for supporting this event, and to FFLAG for their help in developing this initiative to date.